Firefox's New Tab Page, Good Move or Too Late? When you currently open a new tab page in the Firefox browser, either by clicking or using the shortcut Cltr-t, you see a blank white page with no information whatsoever, not even a search form. Other web browsers, like Opera for example, are displaying information on the page, like the most popular web pages visited by you, or a search form to search right away from that page. Firefox users who want to spice up the new tab page have plenty of options in the forms of add-ons. Example add-ons are New Tab King which displays all kinds of information, or New Tab Homepage which loads the selected home page whenever a new tab is opened. 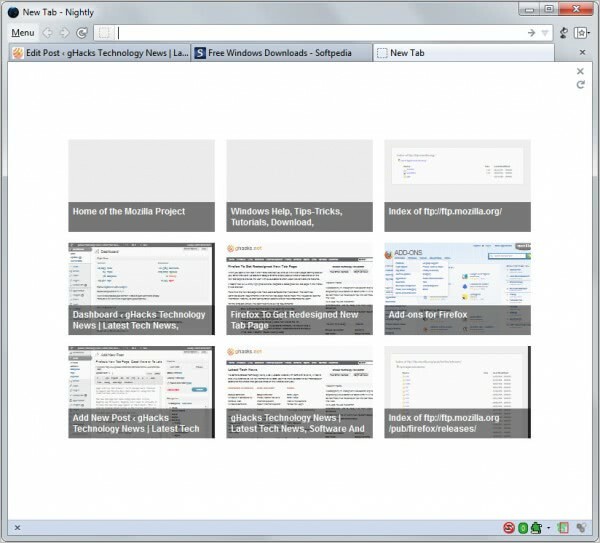 We already know for some time that Mozilla plans to integrate a new tab page into the browser. First mockups were released in August and Mozilla back then hoped to integrate the final version into Firefox 9. The new tab page has been integrated into Firefox Nightly and UI builds. Nightly users need to activate it to have the new tab page appear in the browser. This is done by loading about:config in the Firefox address bar. Update: The preferences have been removed in Firefox 41. You can restore the functionality by installing add-ons. You then need to filter for the term newtab in the filter box which should reveal the preferences browser.newtab.url and browser.newtabpage.enabled. Set browser.newtabpage.enabled to true with a double-click. Once done, double-click browser.newtab.url and change its value to about:newtab. Some Firefox users may need to create the parameters if they do not exist. Right-click on the page and select New > String for the browser.newtab.url parameters, and New > Boolean for the browser.newtabpage.enabled parameter. The browser should begin to collect data for the New Tab page after a restart. All you see on the page is a selection of nine web pages that you have visited in the past. You can remove individual pages from the page by hovering the mouse cursor over the entry and clicking on the appearing x icon. It is alternatively possible to drag and drop thumbnails around, and to pin select sites so that they are always displays on the new tab page. Holding down CTRL while using the mouse wheel zooms in or out of the page. The only remaining options are to reset the new tab page information and to hide the information which returns to the blank new tab page layout that is currently used (with the exception of a small icon in the upper right corner to turn it on again). The display has a few issues currently. Some pages for instance show no thumbnail image, only the page title. And since there is no one-page-per-domain limit, you may end up with four, five or even more pages from the same domain displayed on the new tab page. While Mozilla aims to include a basic speed dial feature into the browser, other browsers make use of more sophisticated new tab pages. Opera for instance supports speed dial extensions which can display dynamic contents on the new tab page. Users who prefer to stick with the blank page can do so, which is one of the advantages of the browser over its competition. The new tab page as it is presented now may not be to the liking of most Firefox users. While it may have its uses, it lacks customization. Firefox users are currently better off installing an extension that brings their new tab page to life. It needs to be considered though that the new tab page has only been included in the nightly version of the browser. Chances are that we will see changes coming to the page before it hits the stable version later this year. A look at the New Tab page of the Firefox web browser that Mozilla introduced recently. As long as the blank page option is preserved this is a good option. I have Firefox open to a blank page to speed the launch of Firefox. I did add an image with a script removing the blank page dullness. A blank new page is fine with me. That’s what addons like SpeedDial are for…to customize the browser to your liking. How do you get it back to a blank page. newtab.url is set to true!! Uhm. You can have totally empty new pages in opera. All the dials can be VERY easily deleted by clicking the little x’s, search also easily removable. The new speeddial pages open up absolutely instantly so no “load slowing ugliness”. Clutter? You can have as many or few dials as you want, size and everything is up to you. Please don’t talk nonsense if you seemingly have no clue about it. As for Firefox Speeddial addon does much much more. I think that people who use extensions like SpeedDial do not require new pages like that. i love Opera speed dial. I already tryed to put this on firefox, but dont liked the add-ons. hope this default new tab page works better. In all fairness Martin, that should have been placed before yours and PCWorld’s criticism of the feature. ExtremeTech put it best in the first sentence. Update 01/27/2012 @ 12:15 ET: In a perfect example of why you shouldn’t rely on Nightly builds, the New Tab Page has actually been removed from the latest Nightly. If you want to try it out, you’ll either have to wait until it’s put back in (hopefully tonight or tomorrow), or use the UX Nightly build. That PCWorld article is garbage. Seriously. Quoting a comment from someone from another article on a different site just to add more Firefox bashing. Bad move AND too late. How do you get the tab feature back to a blank page?